At the end of last year I was awarded one of the Australian Government’s Endeavour Research Fellowships to develop a research project examining music development activities as a vehicle for reconciliation in Sri Lanka. Fast forward a couple of months and here I am in Colombo, sitting in a small apartment in a seaside suburb, getting my research project off the ground. I’ve been here a little more than a week now. In that time, I’ve stayed in a guest house in the seaside suburb of Mount Lavinia, flat-hunted in two different suburbs eventually moving into a flat in Dehiwala, jogged on the beach at sunrise several times, eaten different varieties of rice and curry on a daily basis, attended a Carnatic Music Festival and a performance by the Symphony Orchestra of Sri Lanka, and joined the masses at the February Full Moon Perahera (Procession) Gangaramaya Temple in central Colombo. I’ve also had long conversations with colleagues here, mapped my way through the different activities that make up the Sri Lanka Norway Music Cooperation [SLNMC], and begun to scope out what the research project should include. The Sri Lanka Norway Music Cooperation is, of course, the reason I’m here. It’s a partnership between Concerts Norway and Sevalanka Foundation in Sri Lanka that aims to revive and support traditional music practices, build practical and logistical skills among music industry professionals to raise standards of live performance (for example, supporting the skills development of audio and lighting personnel, music event management professionals, and field recording producers), and engage different sectors of society in music participation. The flagship events of the Music Cooperation are the Jaffna (in the north) and Galle (in the south) Music Festivals, held in either city in alternate years. The festivals attract tens of thousands of visitors, and gather together traditional and contemporary music performers from across the country. Other Music Cooperation activities include workshop programs in universities, a Children’s Festival, training for the next generation of folk musicians (i.e. children) to encourage them to feel proud and excited by the traditional instruments, music and dances of their local area and ethno-religious heritage, a radio program, development of a comprehensive online music archive, and partnerships with three national orchestras (symphony, youth, and oriental) based in Colombo. So where do peace and reconciliation come into this program of music development? Anecdotally, in all sorts of ways – through the opportunities it provides for performers from around the country to be exposed to each other’s traditional practices and instruments, to present their music to diverse audiences, meet in safe, welcoming, and depoliticized spaces, and importantly, the chance to talk and potential form friendships and collaborations. For audiences, it is in the cultural learning, and the demystifying of the ‘other’ (for during the three decades of civil war, the northern and eastern parts of the country became increasingly cut off and isolated from the capital city, central, western, and southern provinces). The different activities have not necessarily been designed to explicitly address peace and reconciliation needs — they are music activities first and foremost, and they have broad appeal for this reason. But participants and organizers alike feel they have witnessed and experienced positive changes in intergroup relations during the 7 years (so far) that the Music Cooperation has run, and there is a pressing need to examine more critically what impacts the program may be having on reconciliation between country’s divided communities. And that’s where I come in. My role is to document the changes taking place in peace and reconciliation outcomes, as experienced by participants and organisers across the range of SLNMC activities. I’ll be developing research tools to best capture these changes and also allow for unexpected changes and outcomes so that we get a multidimensional picture of the different ways these music activities may impact people’s lives. I’ll then write a report that can inform future NSLMC activities and establish the baseline for future program evaluations. I’ll be doing this alongside my PhD work which examines music schools in post-conflict countries. There are lots of contextual similarities but also anomalies, and I’m curious to see if and how the emergent themes from my PhD research might play out here. That’s the broad brushstroke picture of what’s planned; we are now working to narrow down and tighten up the scope. I am only in Sri Lanka for three months (I’ll be doing the write-up in Norway when I am there end-May to mid-July). One very interesting development that I learned of this week is that the presentation I gave for Bangladesh Music Week (at the invitation of Concerts Norway) in November last year on music, human rights, and conflict resolution has inspired a group of students from the University of Peredeniya (Kandy) to initiate a research project on their Music Cooperation activities using Allport’s contact hypothesis as a framework (this was one of the theoretical frameworks I introduced in my presentation). Hopefully I’ll be able to work with them to shape this project and include it as a component of my research. This is my first blog post in many months, and that is largely because life took so many unexpected turns for me in the last 6 months. Sitting here in my airy (but still hot) little apartment, ceiling fan spinning reassuringly overhead, hearing neighbours call to each other in the street below, my stomach full from the egg hopper with caramelised onion sambal I ate for my dinner, thinking about the project ahead, and the PhD, and the whirlwind of events that have made up my life over the last 6 months, I find I keep thinking, “Wow. What a life!” And what a privilege, to get to engage with things you really care about (music, and social justice) in such diverse and fascinating places. Here goes! More soon. That’s okay, I thought. We don’t need to call it improvising. We’ll just make stuff up. This interaction came on the first day of a 2-day training project I ran for a symphony orchestra recently, aimed at encouraging the musicians towards performances that moved beyond standard concert formats into more interactive, informal, and responsive models, such as those that are appropriate in many community contexts. I describe it as flexible musicianship, and it involves breaking down the intentions behind a performance, and exploring processes like workshopping, teamwork and collaborative decision-making, composing, and yes, the i-word, improvising. Why does improvising create such tension for a lot of orchestral musicians? As this man said, and as others have pointed out in many training sessions before this one, improvising is pretty much the complete opposite of what a professional orchestral musician is asked to do musically in his or her daily job. Orchestral rehearsal and performance are about honouring the intentions of the composer whose music sits on the music stand in front of you. The group of 50+ musicians all make that commitment. They place their trust in a conductor whose interpretation of the score will determine the nuances of the performance, and their job is to perform their part accurately, honouring the vision of the conductor and the composer, ahead of their own personal preferences or choices. By contrast, improvising is all about personal preferences and choice. Of course there are stylistic ‘rules’ or parameters that govern the choices that you may make in any particular context, but there is a trust in the moment and in the work you have done to prepare beforehand. Something that comes out slightly differently to what you’d intended is not necessarily a mistake; it can also be a new path, opening up a serendipitous set of possibilities. This is quite a different mindset to playing and performing in an orchestral context. What the conversation about improvisation reveals is the way that our musical enculturation establishes within us a set of values and beliefs about music-making. These values and beliefs determine what makes sense and feels comfortable to us. 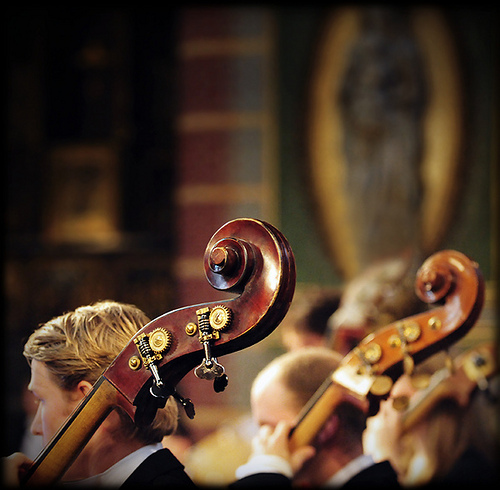 Orchestral music – performance, and the training that prepares musicians for this work – is underpinned by values such as precision, virtuosity, and accuracy (e.g. there are right and wrong ways of playing this music); expertise; and clear communication of hierarchies (leaders need to act with authority so that players can relax and feel they are in good hands – more a benevolent dictatorship than a collaboration). When the intention is one of honouring the music as a thing that exists autonomously, the finished ‘product’ is the focus, rather than the process or experience of getting to that end goal. When my non-improvising musician talks about ‘not improvising’, he is revealing his musical enculturation in two ways. One is the discomfort of working musically in a more open-ended or less predictable environment. This jars with the expectation of predictability, and his perceived responsibility for accuracy and ‘correct’ realisation of the music. The other is about the way those values are loaded into a word like ‘improvisation’. In a musical world where music is presented to others, rather than a platform for participation, ‘improvising’ refers to a different musical expertise – that which is developed by a musician who has studied in depth the techniques and language of musical styles that are not dependent on notation. It takes years of dedicated, focused, painstaking work to develop that language in order to improvise with fluency. I can see why he wants to say from the outset that he doesn’t “improvise”. Therefore, I don’t use the word ‘improvise’ in these contexts, at least, not at the start. It invokes too much immediate resistance and fear. In reality, the improvising you do in a workshopping situation or participatory performance environment, is more about creative thinking, responding spontaneously ‘in the moment’, and seeing your musicianship as a kind of arsenal of possibilities that can be applied in any number of situations, rather than only when particular parameters are in place. We can all do this – extremely specialised and detailed training cannot help but establish this kind of skill base – but we may need to learn to dismantle some of the preconditions our musical enculturation has attached to those skills. 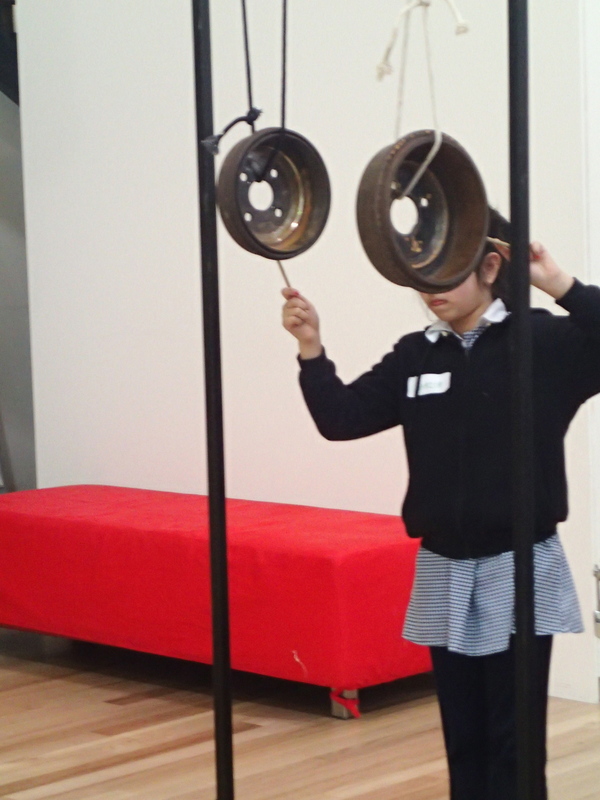 City Beats 2013 workshops drew to a close last week. We finished off this year’s Landscapes theme by creating music inspired by the sounds and rhythms of the city – City Beats. (It was only after I’d planned the project that I realised this third workshop would have the same name as the whole program). Can you feel the heat rising up from the street? For this city-focused workshop, the whole-group composition consisted of a short rap linked to a vocal soundscape depicting all sorts of sounds of the city. I asked the groups to think about words that rhyme – like ‘street’ and ‘beat’ and ‘feet’ – and that would fit well with our theme. The children brainstormed rhyming words, putting them into sentences, and these came together pretty quickly to form the rap. You can see some of their words in the images below. We created the soundscape using a Grid Score, setting it up over a cycle of ten beats. Why ten? At first I thought I’d do twelve, but then thought that might be too long. So I thought about doing an eight-beat cycle – but eight seemed too square, too solid and grounded. 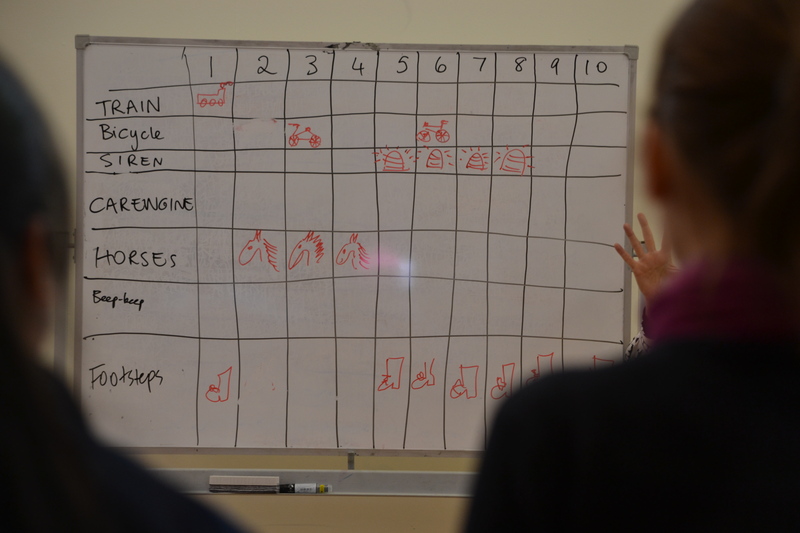 Ten was the perfect cycle length – uneven enough to give the sounds a sense of never quite landing, and short enough to be achievable (and to fit across the width of the white board). I brought along a few bells and whistles to get the soundscape started – we had a bicycle bell, a honky horn, a train whistle, and a strange siren-like whoopee whistle (I don’t know what it is called, it is the kind of thing that might accompany a clown act. The children loved it). We chose numbers in the cycle for these sounds to land on and practiced that first. 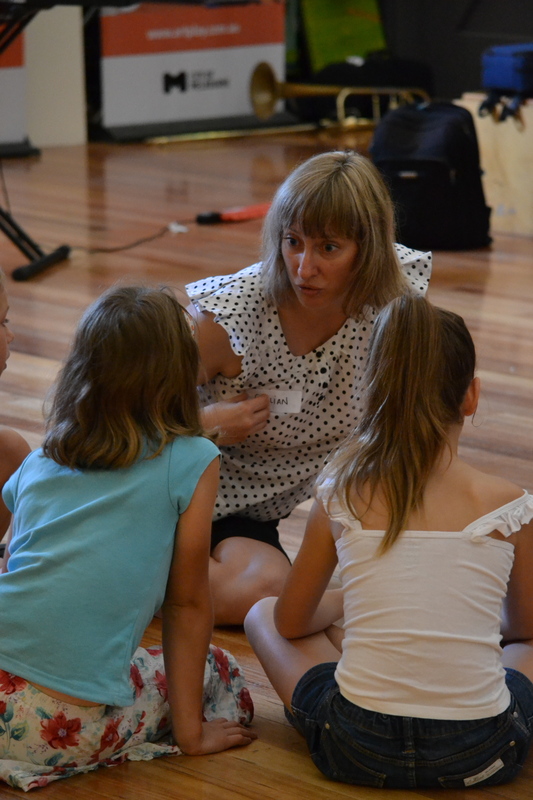 Then, working in small groups, the children decided on other sounds that they would hear in the city that they could depict with their voices or body percussion, and decided where they should appear in the cycle of ten beats, and how many numbers they should cover. Once all the decisions had been made and the relevant squares on the grid had been filled with appropriate symbols (you can see below why I am a musician and not a visual artist), we rehearsed it until it was memorised and ready to record. The choices of city sounds varied somewhat between the groups, but it was the children from the English Language School who really created something unique. Their city soundscape was influenced by the cities they knew well – like Quetta, and Kabul, and Bangkok. They included the sounds of goats and sheep bleating, of the loudspeakers on the minarets of city mosques calling the faithful to prayers, and a traditional song/chant that street sellers from Afghanistan sing. All the children from Afghanistan knew this chant (perhaps it embeds itself into the vernacular the way “Mind the Gap” does in London). The child who sang the ‘call to prayer’ sang it into a loudhailer, in imitation of the thin, slightly tinny sound that the minaret speakers can have. 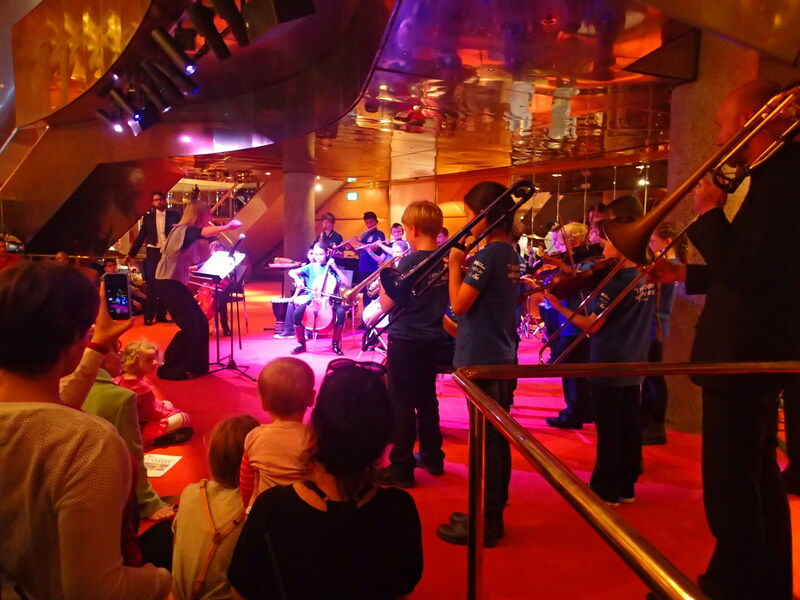 Yes indeed, the city soundscape from the Language School children was an evocative and energetic affair! 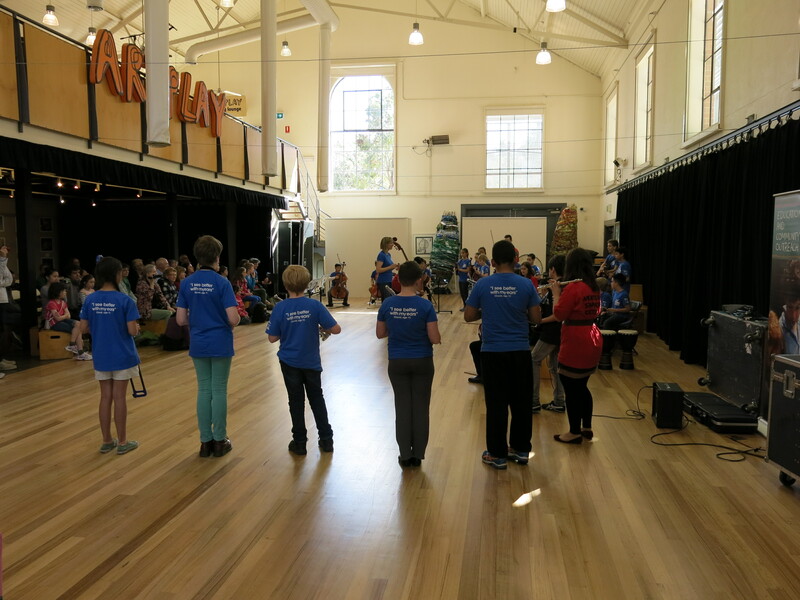 With the whole-group chorus finished, we divided into groups of 6, each accompanied by a musician from the Melbourne Symphony Orchestra, to create additional sections of music. One group took xylophones and created melodic material based on the rhythms in our rap chorus. Another group extended the chorus with further verses and some drumming. 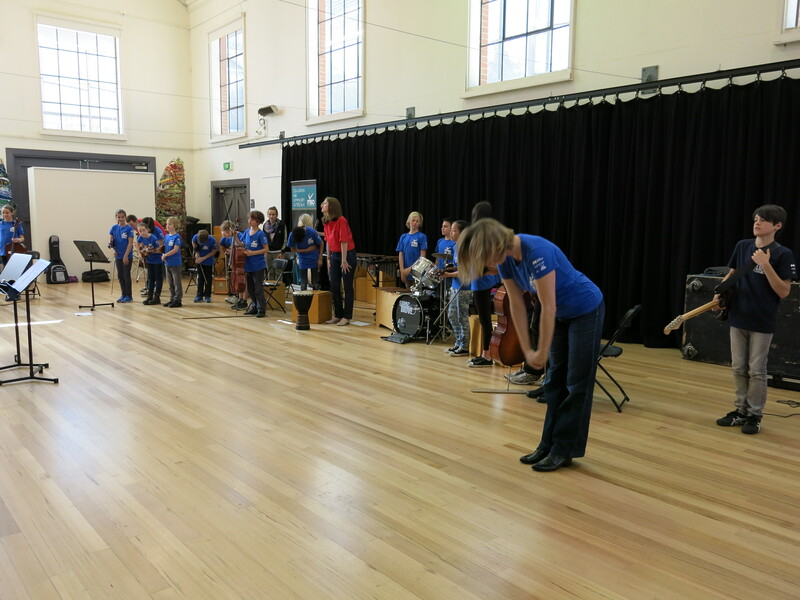 The third group worked with a fabulous array of orchestral percussion and ‘found sounds’ – bass drum, pitched tom-toms, a tam-tam, a suspended cymbal and two suspended brake drums) – to create a rhythmic city groove, working with interlocking patterns, dynamics, and cues. Then, in the last ten minutes of the workshop, we gathered together again, performed our music to each other, recorded the performances, and said good-bye. City Beats days are probably some of my favourite days in the year! There is so much to love. The children come along to ArtPlay thinking they will get to learn a bit of music, and they leave at the end of each 2-hour workshop just buzzing with excitement and energy at all the music that they have created with us. Their teachers are constantly amazed at how much they achieve, and how quickly. 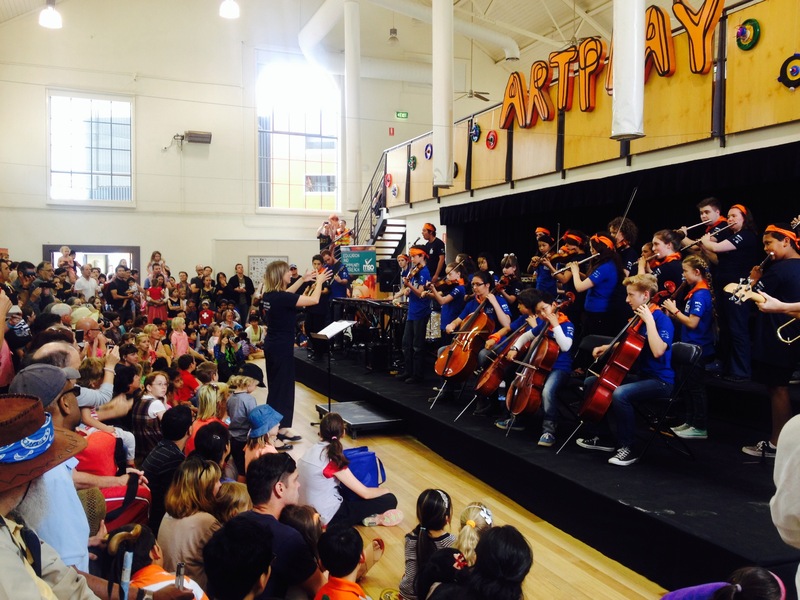 And the MSO musicians, ArtPlay staff and I get to spend two glorious days a term hanging out with fabulously creative children, composing and playing original music. Everyone leaves at the end of each day with all sorts of infectious earworms buzzing in our heads. 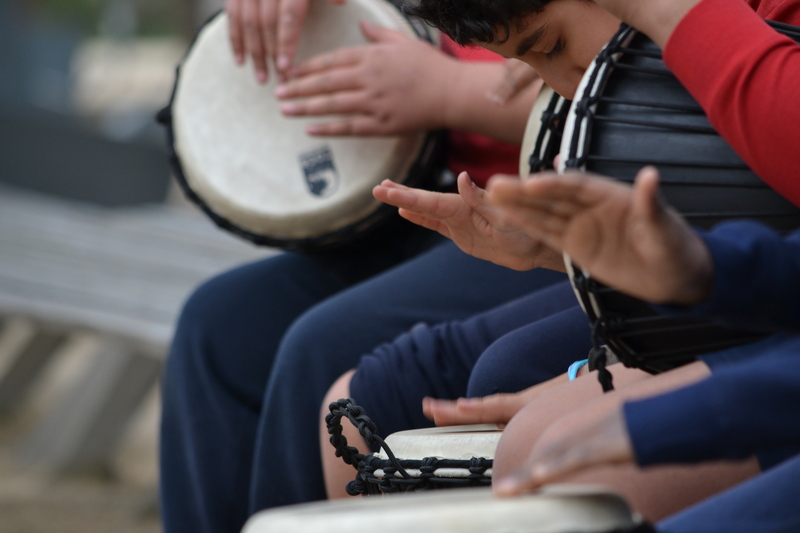 The schools that take part in City Beats each year are ‘disadvantaged’ schools – schools without music specialist teachers, or that have student cohorts from less advantaged circumstances. They may have high numbers of families in receipt of the Education Maintenance Allowance, or who are from refugee backgrounds, or who, because of financial circumstances, never get to take part in any ‘extras’. The program is fully-funded, including travel subsidies, thanks to the generousity of wonderfully supportive and visionary funders, who know that for young people to recognise their talents, they have to have the chance to explore and discover them first. 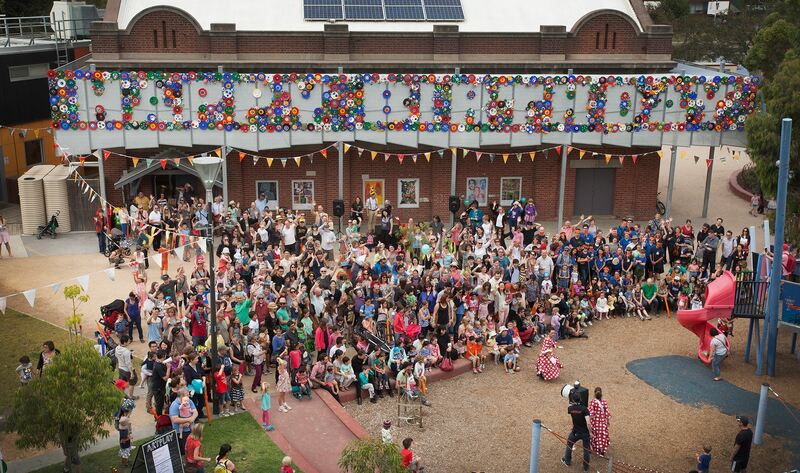 City Beats was part of the ArtPlay/University of Melbourne’s Mapping Engagement 4-year research project at ArtPlay. You can read/download a report of the City Beats program here. 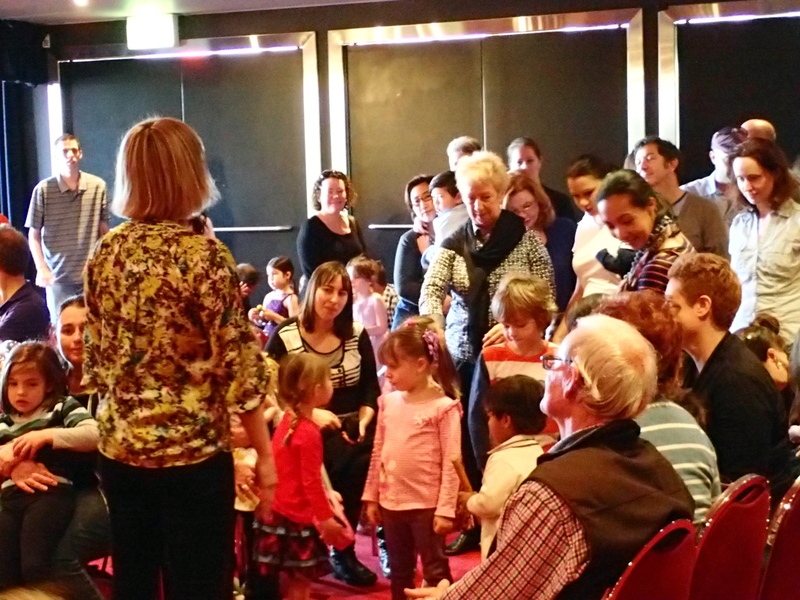 I just completed a remount performance of the MSO ArtPlay Ensemble’s Petrushka-inspired composition on the weekend. 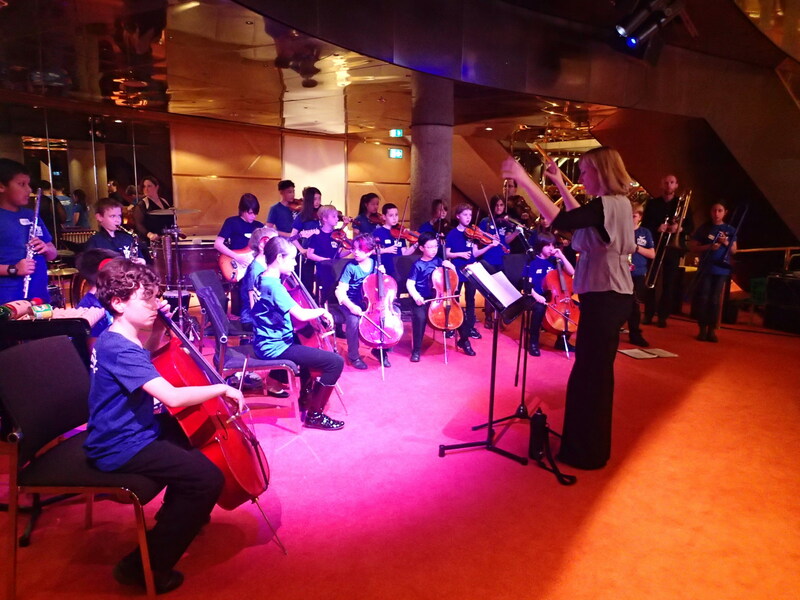 We created the music in the July school holidays workshops, and then reworked it and performed on Saturday night at the Hamer Hall as part of the Melbourne Symphony Orchestra’s Stravinsky Festival. 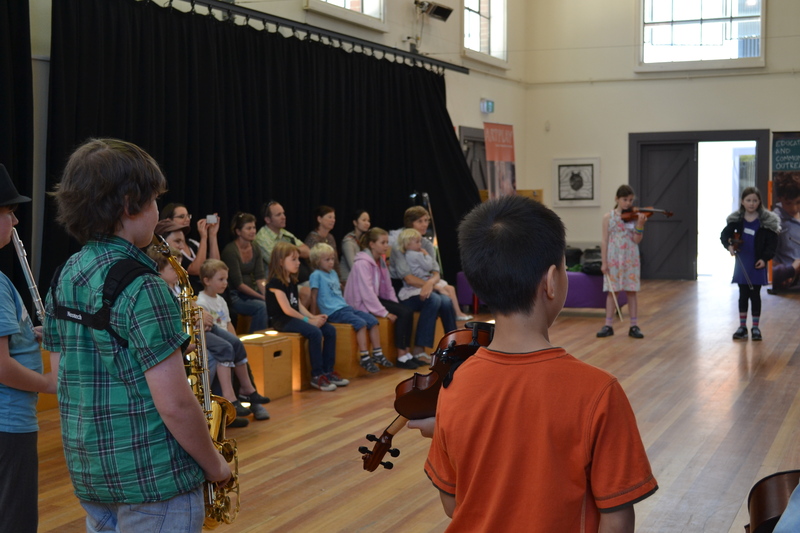 The focus for the Ensemble in this project became about ensemble – playing together. It occurred to me, watching the group rehearse on Friday night when everyone very tired and not very focused (it was the end of the school week, middle of the year –tiredness before we even started the rehearsal was understandable! ), that some in the group only have vague understanding of what it is to play as one of a group. When the energy is in sync and entrained throughout the group, it will carry everyone along with great forward momentum. But when the energy is more scattered, we need to be able to call upon people’s learned ensemble playing skills. If they aren’t well-established across the group, then that sense of ensemble and togetherness never quite locks in. Ensemble skills are nuanced, and subtle. They involve great alertness to small changes in other people’s playing, an ability to imitate and match, to lead clearly and to follow exactly. Good ensemble players can establish a strong ‘flow’ within the group and maintain this, through focus and attention. Ensemble skills also encompass behavioural norms – understanding the social rules and patterns that govern a particular group and how it communicates and organises itself. These are learned skills. They are the reason why an amazing soloist does not necessarily make an amazing orchestral musician. Children can learn these skills. Typically they are skills that are often learned over time through multiple experiences of playing with a group, a tacit knowledge that individuals may not realise they already know. But they can also be taught, and highlighted in the rehearsal process. We rehearsed again on Saturday afternoon, before the Saturday evening performance. We stood in a circle and I led a warm-up that focused people on imitating – copying very slow hand gestures, aiming to have all of use appearing to move in the same way at the same time. We also built up our physical awareness – our composition required everyone to move to other places in the performance space, so we practiced walking slowly, quietly, and with awareness, to new points in the circle, and then making small adjustments so that the circle was perfectly round and evenly spaced once again. We played/performed the Plasticine Man, a light-hearted task that links a simple narrative to story-telling hand gestures, and vocal sound effects. It is a fun vocal warm-up that encourages people to use their voices freely and unselfconsciously. Children can embellish the story, adding elements and sounds and further dramatic events. 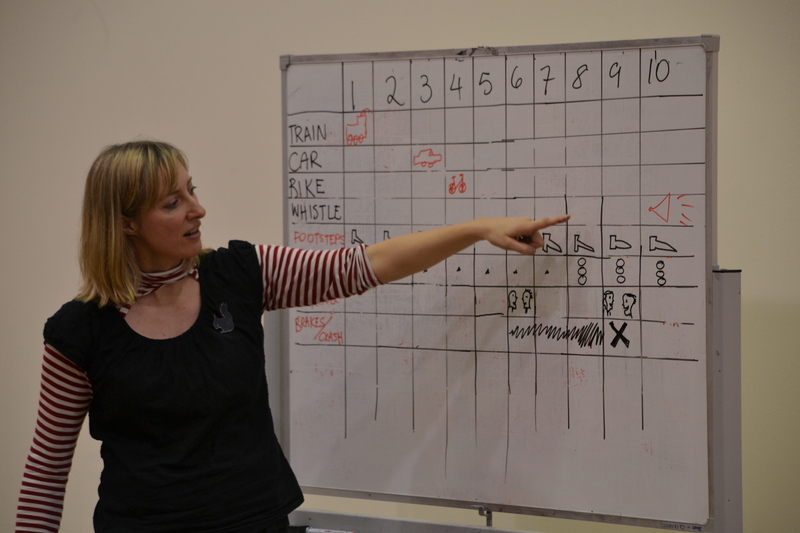 However, for our purposes on Saturday, the focus was one of performing each of the vocal sounds accurately together. To do this, they had to watch for my breath cue, and maintain their focus in the silence that preceded it. We tested our ability to respond quickly and work as a team. Everyone held hands and sent a fast, sharp hand squeeze around the circle one by one. We timed ourselves with a stop-watch, with the goal of improving our time with each reiteration of the game. We got faster each time, so the energy created by the game itself was enhanced by the positive energy that came from achieving a goal. With my language too, I emphasised ensemble. Some children in the group have a tendency to hear an instruction, and then start playing immediately. “Wait,” I reminded them. “We are going to do it together. Watch for the cue.” And the looking began to happen more automatically. The focus was held. Tempos were steadied. Individuals became less self-focused and more group-focused. And they were having fun. Fun, of course, is the magic of good ensemble experiences. It can be exhilarating to play music together when each person is right inside the sound, fully present with the group! And when it is your own music that they you are playing and sharing with an audience in a high-stakes event, it only adds to the sense of satisfaction and delight. 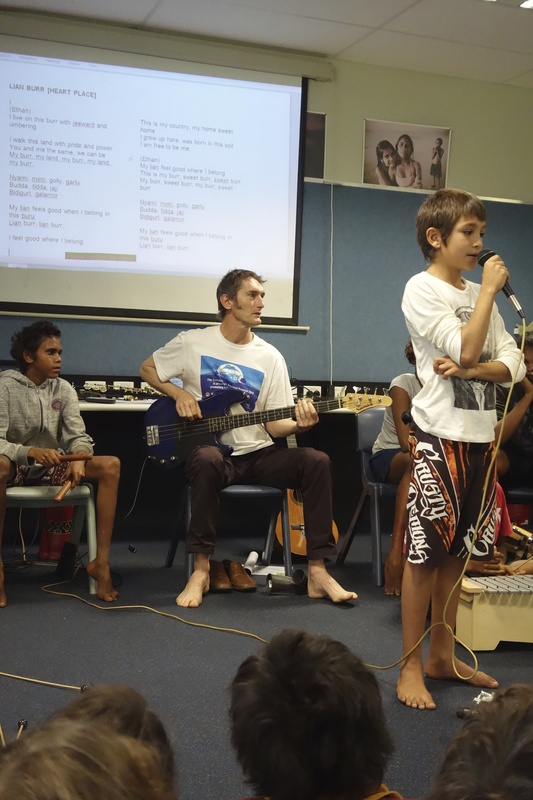 One of the songs created in workshops at Djarindjin-Lombadina Remote Community School evolved slowly, and was the amalgam of three different musical ideas. It took us a couple of sessions to work out how to make it all fit together. One section was purely instrumental music created by half the group. 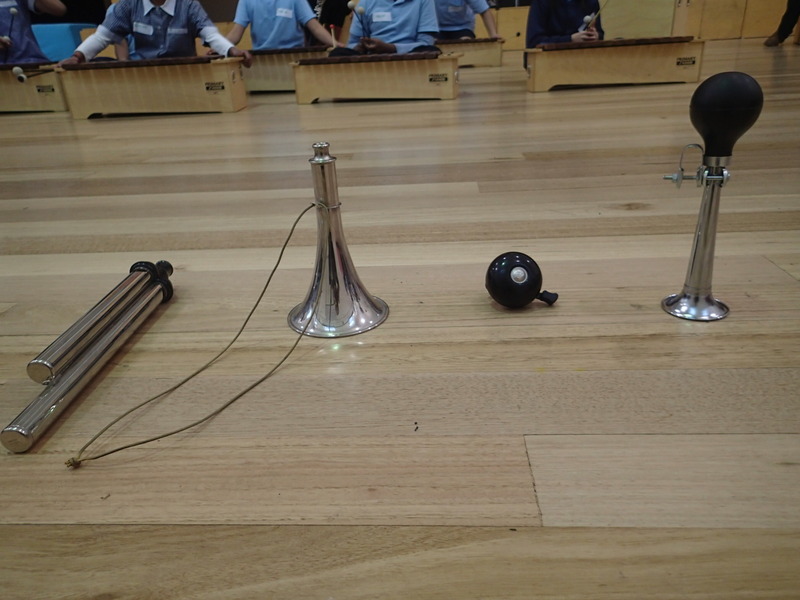 Playing chime bars, metalophones and violins, I got them working in E minor and inventing melodies by getting rhythmic ideas from favourite songs. The violinists were total beginners (as am I on the violin) so we worked on open strings and established a simple rhythmic accompaniment. Another section of the music was a guitar-driven section that used G major and C major 7 chords. 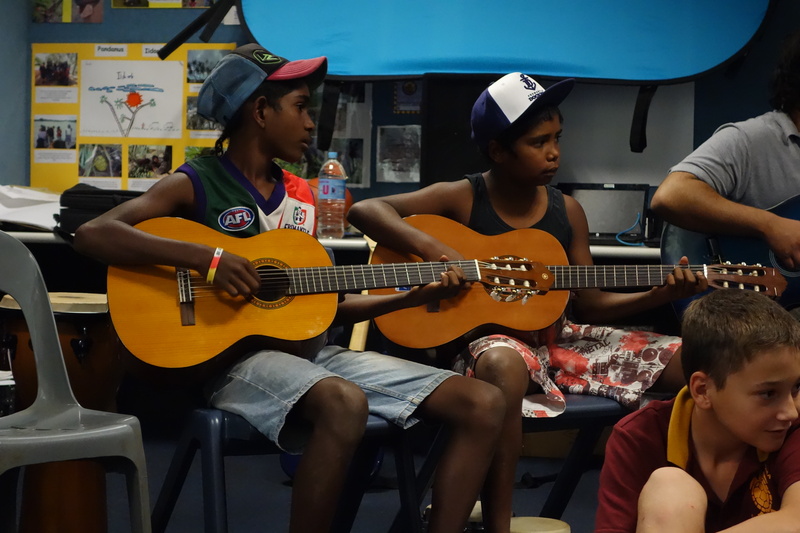 Tony had taught the students how to play E minor and A minor the day before and they were keen to expand on this. Together, we added lyrics to this progression and it sounded like a chorus. The lyrics were in the local Bardi-Jaawi language and listed the names of different family members. 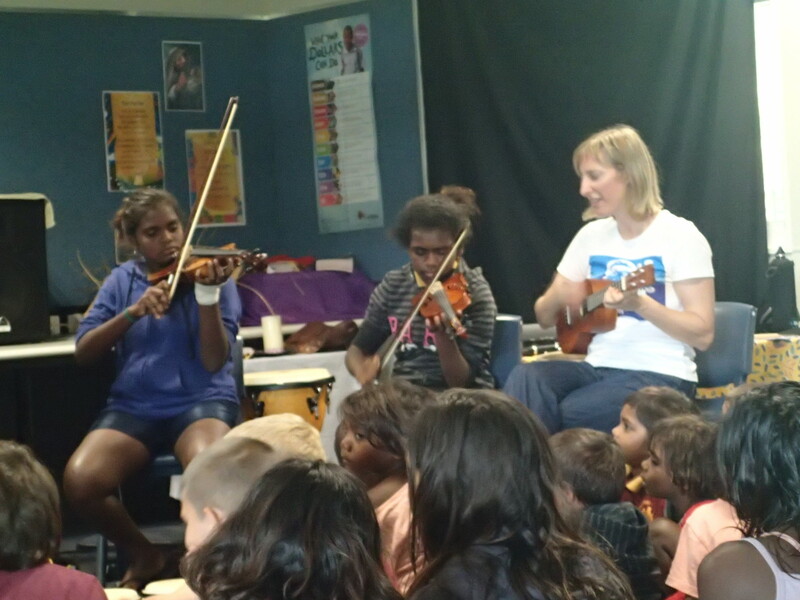 A third section was created by one of the students working with one of the Aboriginal Teaching Assistants. Together they wrote lyrics about belonging to country, feeling the presence of the ancestor spirits, and the sense of strength and belonging that comes when you are in your own land. Have a listen! One of the short melodies was inspired by Macklemore’s Thrift shop. See if you can spot the connection.